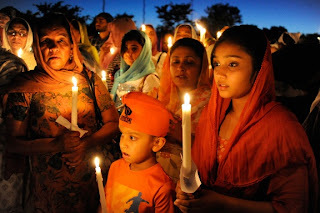 Strong Families Blog: Violence against Sikhs and "the sense of white supremacy"
Violence against Sikhs and "the sense of white supremacy"
This is the fifty-seventh mass shooting in the past thirty years in the United States. Each one is treated as the work of a freak. Patterns are shunned. Structural factors such as the prevalence of guns and the lack of social care for mentally disturbed people should of course be in the frame. But so too should the preponderance of socially acceptable hatred against those seen as outsiders. Intellectually respectable opinions about who is an American (produced, for example, by Sam Huntington, Who Are We? The Challenge to National Identity) comes alongside the politician’s casual racism (Romney’s recent suggestion that the US and the UK are “part of an Anglo-Saxon heritage,” erased in a whip lash the diversity of the United States and Britain). Racist attacks are authorized by a political culture that allows us to think in nativist terms, to bemoan the “browning” of America. By 2034, the Census department estimates, the non-white population of the US is going to be in the majority. With the political class unwilling to reverse the tide of jobless growth and corporate power, the politicians stigmatize the outsider as the problem of poverty and exploitation. This stigmatization, as Moishe Postone argues, obscures “the role played by capitalism in the reproduction of grief.” Far easier to let the Sikhs and the Latinos, the Muslims and the Africans bear the social cost for economic hopelessness and political powerlessness than to target the real problem: the structures that benefit the 1% and allow them to luxuriate in Richistan. In the rest of his article, Prashad also offers a history of acts of violence against Sikhs in the United States tracing back to the 19th century. In addition, he addresses the problems the initial mainstream media responses to the shooting, for example when CNN reported that Sikhs are "unfairly targeted" because they are confused with Muslims. Read his complete article here. There are many ways to stand in solidarity with the Sikh community. For example, South Asian Americans Leading Together (SAALT) has a Google Map of Nationwide Vigils for Oak Creek Sikh Community. Please, please, attend in remembrance of the victims of the tragic shooting at the Oak Creek Gurdwara. SAALT also has links to resources and suggestions to ways you can support the families in Oak Creek. Please share these with your networks!